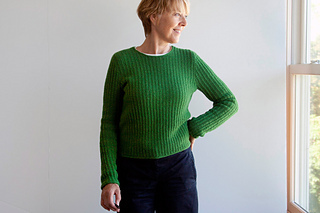 Introducing Riddle Me This – a long-sleeved, textured pullover, knit loosely in Garter Rib throughout. Worked top-down, its bodice and sleeves are knit flat at first, then joined for circular knitting to their I-cord trimmed hemlines. Bodice shaping is made simply, by varying needle sizes along the way. Sleeves are knit separately with short rows at their cap for smooth shaping and ease in setting in. 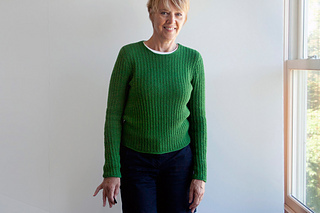 I think you’ll find this shapely pullover to be a fun project with a versatile result – enjoy! Shown in size 34¾“/88.3 cm, worn with no ease. Note that waist measures may be modified simply by altering needle (ndl) sizes. Shown in Chickadee wool by Quince & Co. (100% wool; 181 yds / 166m per 50g skein); color – Parsley #129; 7, 8, 9, 10, 11, 12, 13 skeins, or for comparable yarn, approximately 1280, 1440, 1610, 1770, 1960, 2115, 2290 yards / 1172, 1318, 1474, 1620, 1794, 1934, 2094 m. I always have additional yarn on-hand for swatching. Long-tail CO, Cable CO or Knitted CO, circular knitting, decreasing (SSK, K2tog), increasing (m1R, m1L), short row shaping, setting in sleeve caps, stitc pick-up around neckline, and I-cord BO. 9 page PDF includes pattern instructions, photographs, schematics, instructional links, and definitions for relevant abbreviations.